It was one of those days—an infernal Friday in July—horrid heat, high humidity. We decided to eat outside—deep in the thick of it—where central Kentucky summer clung to us like damp nightmare and we sauna-ed, even in the shade. We’d been planning this for months—back when we were still living in Haiti and the earthquake-tsunami double whammy hit Japan, when it looked like my disaster responding partner and I might be bound for Tokyo ourselves. So it happened that on Friday, Emily/Ambler Angel of “Hey from Japan” and the “Nose” (whom you’ll know is Emily’s sister, if you read her blog), not to mention the extended Clampitt Clan, met my partner Sara and me for lunch. Tall, thin, curly-haired Emily—in khaki skirt and laughing Buddha—a sister, and gaggle of Clampitt kids landed in downtown Lexington, ready to sidewalk chalk the afternoon away—a sandwich here, a latte there. 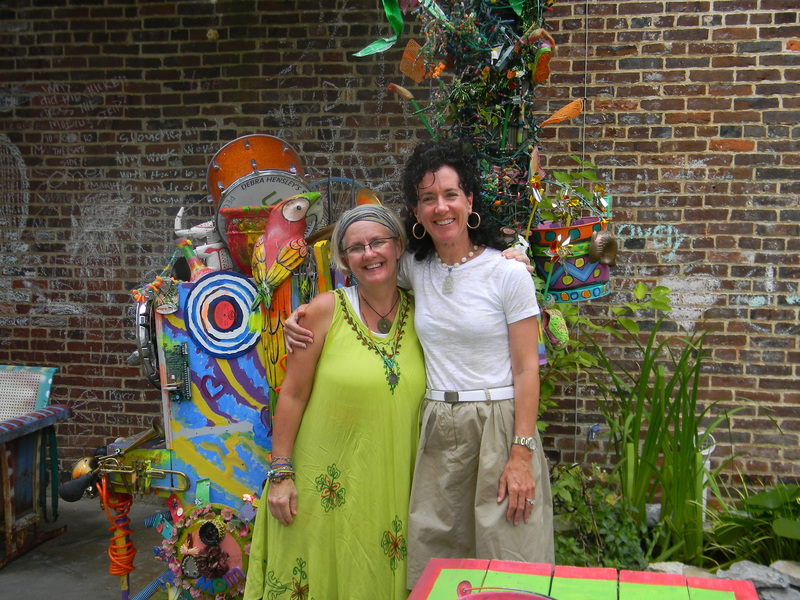 We met at Third Street Stuff, a hip and happening Lexington hangout with beaded “trees” and lots of picnic table art. There we WordPress bloggers convened a meeting of seismic, Freshly Pressed proportion—Haiti and Japan, across a painted, purple picnic table. Yes, we discussed the struggle to recover from massive natural disaster—especially on islands, where there’s no place to even put the rubble. But mostly we laughed our asses off—some parental craziness here, some sister sanity there. We epitomized the “it’s-like-I’d-always-known-her” cliché. But then, clichés are clichés for a reason, mostly because they’re so damn true, cause to meet Emily is to love her, to laugh with her, and then to laugh with her a whole lot more. And the “Nose”—you’d love her too. Next summer in Kentucky, hopefully we’ll reconvene and rock the patio at Third Street Stuff all over again. Maybe we won’t solve the world’s problems, but we’ll discuss everything from peace in the Middle East to orangutans in Borneo—and we’ll do it all with abundant humor, not to mention amazing grace, a piece of Japan planted in the Blue Grass. So, infernal Friday or not, who knows what will happen with the next seismic shift—cause where earthquakes and blogs collide, WordPress cliché can happen—and friendships can form along the fault lines. This entry was posted in Blogging/Writing, disaster, Friendship, Haitian presidential election, humor and tagged blog, blogging, cliche, earthquake, Freshly Pressed, friendship, Haiti, Japan, Kentucky, Lexington, life, postaweek2011, Third Street Stuff, WordPress, Writing. Bookmark the permalink. Nicely written! I have been waiting to hear all about your get-together. Sounds like fun was had by all. Really wish I could have been there too – you and Emily are two of my WordPress contacts I’d love to meet. Actually, I thought the same thing when we got together–that somehow you should have been there–like you would have fit perfectly! Maybe we can all gather in South Africa. How fun that would be! (Or even Japan!) Hope you have a great week, dear Lisa! I’m so glad you got to meet and that the cliche happened. 😉 That looks like a fun place to go and you both look lovely and happy. Thanks so much, Lisa! Third Street Stuff is a block from my house and a great place to have coffee with friends or surf the internet. I plan to do a post about the place itself. It deserves the attention. And it was wonderful to meet the person behind Emily’s posts! It was cliche and cliche is amazing! So fun I can hardly stand it. I’m seriously considering getting a purple picnic table and hoping bloggers just show up! You get the table–I’ll do the decorative painting! It’ll be a blast! Oh it was so much fun! I could’ve sat there all day- just laughin’, plottin’, and drinkin’ coffee but the natives got restless….. Do we have to wait a year to get together again? No, my dear, of course we don’t have to wait a year! I say we reconvene asap–either in South Africa or around Tori’s purple picnic table–maybe both! PS: If you reconvene in South Africa next year, count me in! I think South Africa sounds like an excellent location–too excellect for words. I want to go to Cape Town–(Is that one word or two?)! But can we also count you in elsewhere, as well? Maybe? Wow–talk about a lovely spot to gather! I want to go all of these places! It must be beautiful there in the summeer. Not too hot–right? At any rate, I would come there in a second! Maybe Tori and I couid do a road trip and all the others could fly in from their more-exotic, less-Kentucky-Tennessee locations. Plus, I have a few other blog buddies I’d like to bring along! How wonderful you could meet a for-real-fellow-blogging buddy! sounds like a treat of an afternoon. It was a treat, indeed–great fun–wonderful–and all that god stuff! Hope you are having a happy Monday, Jane! Thanks for reading! Cape Town is two words. And sure, anywhere in SA! I just found you from Robin’s blog and just wanted to say–I admire so much what you’re doing–helping out in disasters. Deep bow…thank you. How great to hear from you, Kathy! Don’t you just love Robin’s photos! I so appreciate your stopping by and taking the time to comment! I hope you’ll come back sometime soon! What a little piece of heaven. We fall in love with each other on these blogs, with the minds and humor and courage. We get a snapshot in our heads of who these precious people are and carry them around with us. But then to pull that virtual relationship out into a 3-D meeting of skin and laughter and conversation explodes the myth of Online Isolation. You (we) are recreating Community. Yes, we are, indeed, recreating and redefining community! Blogging has given me an entirely new sense of what it means to connect and find friends–a little piece of heaven in the blogosphere. Can we drag you along to SA or Canada or maybe to a gathering around Tori’s picnic table in Tennessee? I’m so happy we found each other, Sandy! Great writing on this post! I remember when Emily was Freshly Pressed…I read her account of the earthquake and was hooked on her tales for the next week. Gradually drifted away from her blog, but I should probably check it out again. I’m glad that you guys got to meet – it’s fun! That was a great post, but, actually, her more recent Freshly Pressed was even better–the one about the Tokyo Tower. You should go back. She is really, really funny! And every bit as fun in person. I’m so glad you liked this one, Robin! We had a GREAT time! Wish you could have been there! That’s great, Lisa. I think you will really like it. We just have to figure out what else we want to do. Do you have any preferences?